This set is a must have for all those of you who love to sew or who know some one that sews and you want to make them some thing special! Its simply gorgeous and I know I will be using it time and time again!!! 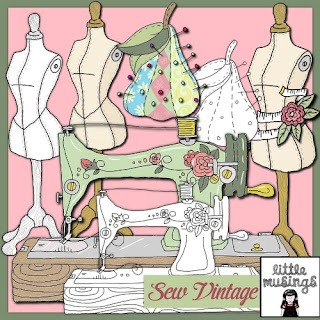 Here is what I made using the mannequin's but there is a gorgeous sewing machine and pin cushion Scroll down for piccy of what you get in the set! I have so many ideas for these and one involves frames and printing on canvas as I have already had ago and they look stunning!!!! You MUST check out the other DT creations they are simply stunning and also check out all the fabby makes from the guest DT Anam, they are awsome! How much is this set? Its only £1.50 and look what you get in it! Dont forget to have a look at the other sets available! Catch you later have a super day today! OMG Lisa the bag is lovely, did you print the digistamp onto transfer paper and iron it onto the bag? ?